It Is What It Is: Saddle Up for Adventure! I'm always excited for the beginning of the week and the opportunity to share with you the exciting things we did over the weekend. Except that our plans this past weekend, while exciting by some definitions, did not play out as planned. 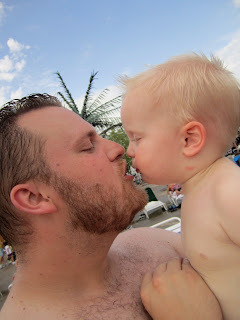 In August of 2010, Joel and I took the boys to Adventureland for a weekend getaway. For those of you not from the area, Adventureland is a local small-but-legit amusement park that is perfect for families with kids as the entire park can be seen in one day. We stayed overnight in a hotel and hit the park bright and early the next morning. 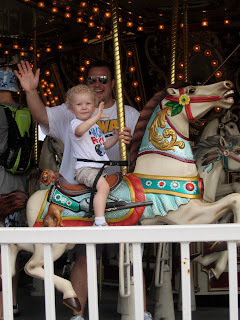 Even then, with Cael being only two and Graham not yet a year old, they enjoyed the rides and the bright lights. Cael was limited by suprisingly few rides, and Graham got to eat Cheerios until he passed out in an apparent carbohydrate overdose. The only problem with our trip, however, was that Joel and I weren't able to enjoy many of the rides ourselves. A couple of times we traded off and one watched the kids while the other rode a roller coaster, but the Tornado is not quite as thrilling when you're alone in the seat. The Space Shot will make you pee your pants, however. I don't care who you are. So this year as we planned our trip, we decided that it would be better to go with some friends that also had kids and were therefore in the same boat. We would be able to enjoy the rides together and this time, test out the park's new waterpark, "Adventure Bay". We decided to share the experience with my wonderful friend Alissa, who I've known as long as I can remember, and her family. Alissa and I were pregnant together (both times) and our kids have enjoyed a number of get-togethers over the years. It was a good match. As the weekend approached, we made arrangements to stay with Alissa's grandparents rather than stay in a hotel. I didn't know these people, so I was afraid to expose them to my children and their loud/sticky/aggressive/sometimes annoying/any-adjective-you-can-think-of behavior. As soon as we entered the house, however, we were greeted with a warm welcome and a frosty "Moe-Garita" courtesy of Alissa's grandpa, Moe. While I am not a fan of tequila, these moe-garitas were sweet, cold, and just what we needed to relax before what promised to be a busy day. Good thing we all had five of them, too. The next day was a five-drink kind of day. We woke up to a light drizzle and the promise of more rain throughout the morning. The radar showed a storm moving through which would be followed by a break in the storm for several hours. Even though it was wet to begin with, we decided to forge ahead and hit the park. We parked, loaded our stroller with our clothes for the adjoining waterpark, and handed over our tickets. As soon as we passed through the entrance gate, the sky opened up and dumped so much rain on us that we felt like we were being waterboarded but didn't have any secrets to divulge. Between heavy showers, the kids were able to enjoy some of the smaller rides that were still in operation. After subjecting ourselves to an hour or so of nonstop rain, we threw in the towel and headed to our cars to enjoy some of the lunch Alissa had prepared in advance. We snagged a picnic table, spread out our lunch fare, and as we popped the first bites in our mouths, the clouds broke and the sun came out. Just our luck. We tried our best to eat quickly, change quickly, and walk quickly across the park to the new waterpark, where we figured we could most take advantage of the brief sunshine. As we entered the main sitting area of the park, a trillion white lounge chairs dotted the ground like my kitchen after Graham empties a box of uncooked rice all over the floor. Each chair was occupied with sunbathers, wet towels and half-drunk cocktails, none as good as the "Moe-Garita". But where would WE go? What should we do with our strollers, and bags, and our completely drenched "dry" clothes? Although the sky was blue, the rain started falling in sheets and almost half of the people in the waterpark snatched up their belongings and ran for the safety of the concession stands and on into the amusement park. We happily claimed two chairs, all the while wondering why so many people, wet from the water slides and lazy river, felt the need to hide from, well, water? For the first time all day, we were able to play freely and the kids loved the many slides and fountains. Alissa and I tested out many of the double inner-tube slides and the guys defied death on the super high water slides. Although he's pretty leery of water, Cael was getting into the fun and decided that he wanted to try some of the smaller curly water slides as well. With Joel at the top to give him a little push, I waited at the bottom to catch his slippery little body. But nothing. Then a small, whiny sound came from the belly of the slide. "Cael, are you in there?" Although I was concerned about him, I could hear his voice so I knew he wasn't drowning or otherwise injured. But he was stuck. We all encouraged him to push himself down, and after a few tense moments, he emerged, rowing himself along the track of the slide in the silliest manner possible. I would so love to share a video of this crazy moment, but like the rest of the trip, I was unable to document any of our adventure because of water, in one form or another. But to give you an idea of Cael's aquatic descent, check out this video of Joel attempting to slide down our driveway last Christmas. The similarities are eery. After freeing him from the captivity of the slide, we nursed his ego and began to pack up. We enjoyed a few more rides in the main park that we were unable to try because of the threatening weather earlier in the day, and then headed out to get some dinner. Although exhausted from ping-pong weather patterns all day, we were starving and in need of food before starting the car ride home. While filling our tanks with greasy appetizers, Graham made his now infamous deposit. That was but a momentary bright spot in his mood, which had been touchy and grouchy all afternoon due to his lack of a nap. Once in the car and snuggled up to their stuffed animals, both Cael and Graham were out. In his final protest to the day's unpredictability, Graham positioned himself like this. And I knew just what he was thinking. "Go pump your pistons, Mother Nature!" Better luck next year.